Learning in the poetic mode is not about studying but about doing, participating. It is pre-scientific, for the beginner, not the specialist, so the specialist, if he was never allowed to play there first, must go back to it in order that he may know his subject at a deeper, more intuitive level. It is about connection with reality through the senses, both internal and external. It is a form of knowledge, it is intellectual, but it includes the emotions. It values the whole, living thing, not the dead parts. It is about concrete experiences with reality either in actuality or vicariously through some medium. It is your little girl watching a frog in your backyard pond, not dissecting it to learn it’s parts. It is your teenager understanding intuitively about a lever because he played on a see-saw for hours in his childhood or used a pitchfork to move hay on your farm. It is knowing the nature and the essence of a horse because you spend countless hours with them, not memorizing it’s anatomy. Poetic knowledge is learning a language by speaking it, not by picking apart every word in the sentence, parsing and diagramming. It is feeling music inside you, dancing to it, singing, understanding tempo and pitch because it’s a part of you, not memorizing sharps and flats and chords and scales. It is living the life of a historical figure vicariously through a high-quality, engaging book. It’s why our kids should spend loads of time outdoors in nature, playing in trees, on swings, with building materials, watching living things, staring at the night sky. It’s why our kids should listen to, dance to, and sing all types of music, hear poetry daily, create their own works of art in imitation of what they’ve experienced, play pretend, and generally have the liberty to just BE in the real world. Poetic knowledge seems to be the key to motivation because it is about what is REAL and we are all desperate for reality. Connection and wonder are the driving forces. Love is the anchor. 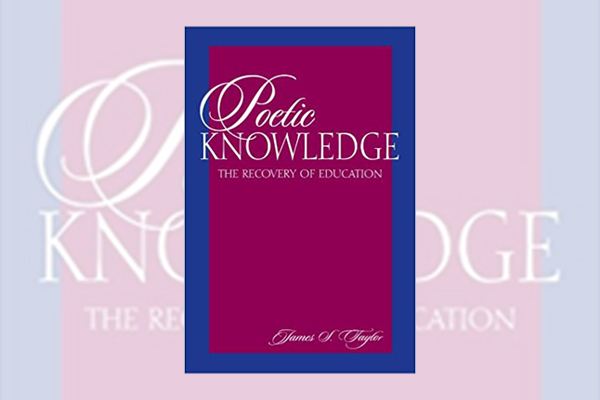 Poetic knowledge synthesizes, brings together, integrates. It looks at the whole, the essence, the nature. This type of knowledge was considered completely valid in the ancient and medieval world, but has lost its validity in the modern mind, replaced by the rigidity of the scientific method which has laid claim to be the king of all forms of knowledge. What an excellent book! I would put it up there with Norms and Nobility by Hicks and A Philosophy of Education by Mason as the triad of top educational philosophy books I’ve read (With Consider This by Glass as a close runner-up!). It was a hard slog at the beginning, but once he got to Descartes it really started picking up speed and the last couple chapters were a breeze. I do wish he would have given more concrete examples at the beginning of the book instead of the end in order to “ground” the abstraction. That seems like it would have been more in line with the thesis of the book! Highly recommended for all educators, those interested in epistemology, or anyone dissatisfied with the reductionistic mindset we’re all swimming in. It’s an eye-opening book, and I’ll be thinking about the ideas for a very long time. This entry was posted in Book Reviews and tagged book, education, epistemology, james, knowledge, learning, philosophy, poetic, review, taylor by admin. Bookmark the permalink.